Are you a fan of those tiny interlocking blocks of colourful plastic? Sure you are! Who doesn't love a good Lego set to build and who doesn't love dinosaurs? 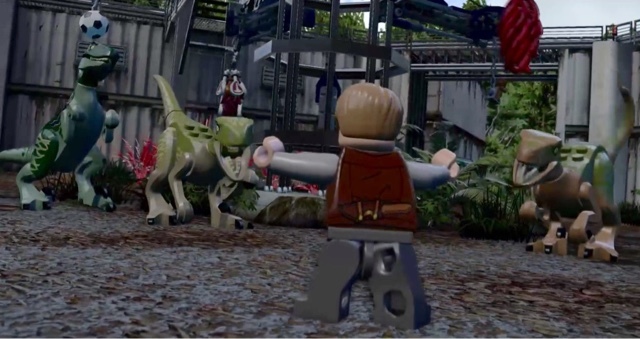 Well, Lego Jurassic World has you covered on both sides. 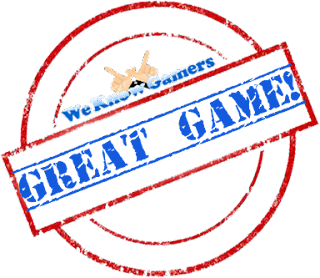 So how does the latest in a huge list of Lego games fair? If you've played a Lego game before, you should know what you're in for - plenty of button mashing to destroy everything in your wake and collecting studs while you wander through levels. 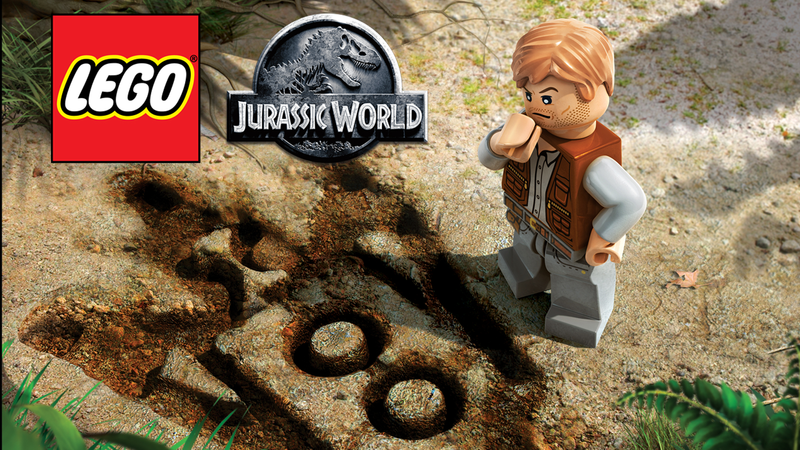 Lego Jurassic World covers the 4 films; Jurassic Park, The Lost World, Jurassic Park 3 and the latest movie, Jurassic World. Upon starting the game you only have the option to play through either the original Jurassic Park or Jurassic World, completing these stories opens up the other chapters. Par for a Lego movie, the cutscenes that go along with the gameplay are incredible recreations of some of the most iconic scenes from their respective films. We've got the T-Rex eating a chap off the toilet, the carnage of a Dinosaur loose in San Francisco, the Pterodactyl bridge escape, all the way through to Chris Pratt holding off the Raptor's. 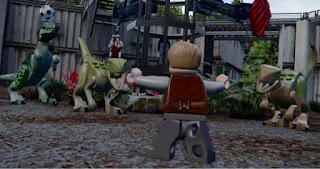 Unlike the movies though, nobody ever gets horribly eaten as the Dinosaurs in Lego Jurassic World seem more like pranksters, biting on people so they can brush their teeth or blocking hunters guns with bananas. That's not to say they've removed all the scares. I genuinely jumped a couple of times when Raptor's jumped out at me from nowhere. All the classic dialogue from the movies has been added to the game which really brings the Lego MINIFIGS to life. Dinosaurs also have their trademark sounds. From Raptor growls and screeches to that iconic T Rex roar, which still gets me every time I hear it! As well as all the sound effects and dialogue, the musical score from each respective film plays in the background of each hub world, which just completes that whole Jurassic Park feeling and experience. As per standard with Lego titles, there's a lot of collectables in the game, with golden bricks being your main reward. You get these for pretty much everything, ranging from beating a level to helping out people in the Park. There's 275 of them in total so if you're a completionist, expect to spend a bunch of your time hunting these things down. Red bricks unlock special options such as score multipliers and gold brick detectors that show you where hidden items can be found. If you manage to find a lump of amber in a story mission, you can unlock Dinosaurs for free play mode, as well as create your own Prehistoric monsters in the labs by mixing different Dinosaur pieces together. Playing as Dinosaurs is actually really fun as you feel like a massive giant, crashing your way through the park. There's a lot of activities to do when you play as a Dinosaur, and they all have special abilities. T Rex's can roar so loud they can shatter large orange stones, and Dilophosaurus can spit acid at special blocks causing them to explode. The Velociraptor is the most fleshed out Dinosaur of them all though, with the smarts to build shattered Lego piles and the agility to jump huge gaps, it's really the go to Dino to have on your side. That being said, getting the lock on icon to target a place you can actually leap to can be a little hit and miss sometimes. Playing through the Jurassic World story will let you play as them fairly quickly, but tracking down the amber pieces will let you use them whenever you like. Additionally, there's "drop in, drop out" local co-op for those wanting a second person to jump in on the action. The nauseating, swooshy two-player camera mode is still there, although it only does that in actual levels where your characters can walk away from each other. Thankfully, you can switch between this and the standard split-screen mode, but that cuts out on some of your field of view. If you're a fan of either Lego or Dinosaurs, then you can't really go wrong here, and having played practically every Lego game that's come out so far, I would easily rank this among my top 3. Sadly it also carried the same typical glitches that has stunted early completionists in the previous games. Having achieved 100% I have was confused as to why I was missing a dinosoar healed. And therefore my elusive platinum gamer trophy. Quickly patched on this occasion it does appear that the Lego masterminds are acting faster than before.